Parsa Wildlife Reserve occupies parts of Chitwan, Makawanpur, Parsa and Bara districts in central Nepal. The reserve headquarters is situated at Adaba r on the Hetauda-Birgunj highway and the Reserve covers 499 sq. kms. and established in 1984.The dominant landscape of the reserve, the Churiya hills ranging from 750m. to 950m. run east-west of the reserve. The reserve has sub-tropical monsoon climate. The forest is composed of tropical to subtropical forest types with sal constituting 90% of the vegetation. In the Churiya hills Chir pine grows and along the stream and rivers Khair, Sissoo with silk cotton tree occur. Sabai grass a commercially important grass species grows well in the southern face of Churiya hill. 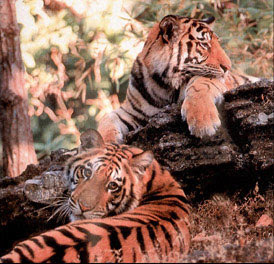 The reserve supports a good population of resident wild elephant, tiger, leopard, sloth bear, gaur, blue bull, wild dog. Other common animals are sambar, chital, hogdeer, barking deer, langur, striped hyena, ratel, palm civet, jungle cat etc.There are nearly 300 species of birds in the reserve. Giant hombill, peafowl, red jungle fowl, flycatchers, woodpeckers etc. are few other common birds found in the reserve. Many kinds of snakes like king cobra, common cobra, krait, rat snake, pythons are found in the reserve due to hot tropical climate.The dominant landscape of the reserve are the Churia hills ranging from 750 m to 950 m, which run east-west. The soil is primarily composed of gravel and conglomerates making it very susceptible to erosion. The hills present a very rugged face with numerous gullies and dry stream beds. As the foothills are very porous, water flows underground and surfaces at a distance of about 15 km from the hills base. The forest is composed of tropical and subtropical forest types with sal (Shorea robusta) forest constituting 90% of the vegetation. In the Churia hills chir pine (Pinus roxburghii) grows and along th e streams and river khair (Acacia catechu), sissoo (Dalbergia sissoo) and silk cotton tree (Bombaxceiba) occur. Sabai grass (Enlaliopsisbinata), a commercially important grass species, grows well on the southern face of the Churia hills. The reserve supports a good population of resident wild elephant (Elephas maxinuts), tiger (Pantheratigris), leopard (Panthera pardus), sloth bear (Melursus ursinnus), garu (Bos gaurus), blue bull (Boselaphus tragocamelus) and wild dog (Cuon alpinus). Other common animals are sambar (Cervus unicolor), chital (Zxis asis), hog deer (Axis porcinus), barking deer (Muntiacus muntjac), langur (Presbytes entellus), rhesus macaques, striped hyena (Hyena hyena), ratel, palm civet and jungle cat. There are nearly 300 species of birds in the reserve. 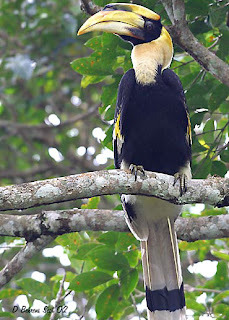 Giant hornbill, one of the endangered species, is found in certain forest patches. Peafowl, red jungle fowl, flycatchers and woodpeckers are a few of the other common birds found in the reserve. Many kinds of snake like king cobra, common cobra, krait, rat snake and python are found in the reserve due to the hot tropical climate.